Hardwood floors are a gorgeous addition to any home, but can often be quite expensive. Many see this flooring option as an investment for a home, as they do not stain as carpets do and are great to style your home with. 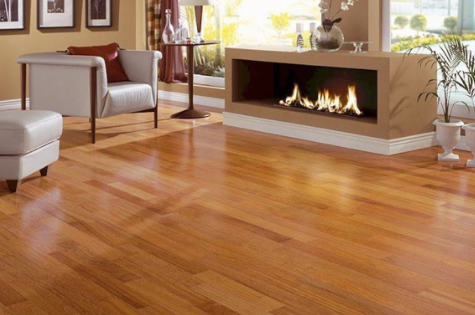 If you have hardwood floors, it is important to protect this investment by maintaining the floors. To do this, you must keep them clean, protected and refinish them when necessary. Here is a short guide to keeping your flooring flawless, and maintaining the investment you have made into your home. It is important to keep your flooring clean, as dirt and dust can create an unattractive look. The presence of dust and dirt can also prevent the true of the colour of the wood from being seen. That means that the colour you have spent time and effort choosing or coordinating your furniture to is hidden, and your styling efforts gone to waste. When cleaning, do not attempt to mop hardwood floors with excessive water, as it can cause swelling which can damage the flooring. Investing in a steam cleaner is a great idea, as it effectively cleans flooring without causing swelling of the wood. A harsh condition of having hardwood floors is that they can be scratched by furniture and shoes. Put felt stickers on the bottom of your furniture to avoid scratching the floors. Take care to replace these every so often, as dirt and dust can collect in them creating a sandpaper effect. To further avoid scratches caused by furniture, do not push them across the floor when moving. Instead, lift and carry, as this avoids scratching altogether. Another thing to consider is the potential scratching caused by the heels of shoes. Try to avoid wearing high heels in the house to prevent this. Ultraviolet light can age and discolour hardwood flooring, so its important to protect your flooring from light coming in through windows. Flooring located near windows will face harsher conditions than flooring located further away. This means that your floor will age differently, so although you may accept the overall aged colour of your floors, you may not be aware of the blotchy affect it can cause. Invest in some good quality blinds to protect your floors. If you want your floor to age evenly, rearrange your furniture often. In order to protect your flooring over the long term, make sure to refinish your flooring every three to five years. First, you will need to find out what kind of hardwood floors you have in your home. Common floors have a wax or polyurethane finish. You can determine which flooring finish you have by allowing a few drops of water sit on the surface of your flooring, and examining the results. If the droplet beads up and sits on the surface, it is likely a polyurethane finish, while if the water is absorbed into the wood, it is likely a wax finish. Allow the water to sit for a few minutes, as sometimes absorption can happen slowey. Floors with these finishes can be polished with the relevant products. If the flooring is in quite bad condition, then a full refinish may be necessary. This involves sanding back the damaged wood surface to reveal a fresh layer underneath. This layer can be stained or varnished in any way you please, and creates a fresh flooring finish. So there we have it, a short guide to keep your hardwood flooring looking flawless. Not only will these tips keep your flooring looking amazing, but will your overall home aesthetic to improve. So get started and create your flawless flooring today! Good luck. Why Get Parquetry Flooring for Your Home?